Notes from Val's Kitchen: Falmouth Bulletin Throwback, December 2010: "Nutcracker Sweet"
Falmouth Bulletin Throwback, December 2010: "Nutcracker Sweet"
A throw back from my days when I wrote for the Falmouth Bulletin. This story appeared under the column: "Lessons From Val's Kitchen" in early December of 2010. 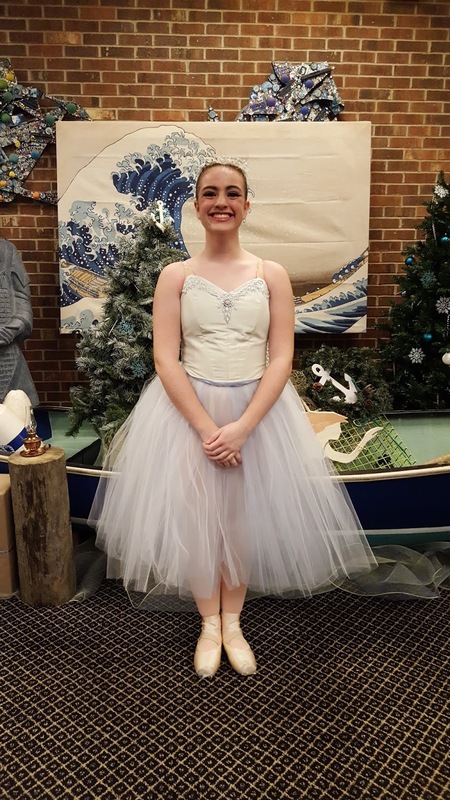 Eight years later, Ava is still in love with dance, still dancing in the Sea Captain's Nutcracker this weekend: November 24th and 25th. However, she has graduated into one of the "older" dancers, now wearing satin pointe shoes and an icicle tiara. Ava never tired watching all of the “older” accomplished high school age dancers during the long practices at her dance school. I had to drag her out after each four hour session was finally over even though she spent such a short period of time practicing her own part and the rest of the time observing. It seems she just can’t get enough of satin pointe shoes and leg warmers. Being involved in a large scale production is exciting but the costumes make it more so. Ava couldn’t wait to put on her mouse hat complete with pink and white felt ears, and sparkly gold whiskers made out of pipe cleaners. The outfits were over-sized and baggy. They made all the kids look like they were fat mice who had been stuck in the dryer for a cycle. The mice in the fight scene added a touch of comedy as they jumped and scurried about cheering and jeering. Of course, this scene was far too short in my opinion! But when the few minutes were over, Ava waited patiently back stage for her next part, eager to change into her “sea glass” costume and color with her friends until she was called back to stage during Scene 3. I understand Ava’s excitement. The ballet always seemed so magical to me, and still does. Ever since my grandmother took me to Boston when I was about ten yrs old to see the Nutcracker, I have loved the music and hummed along, visions of Sugar Plum Fairies dancing in my head. Tchaikovsky’s music is my go to sound track for holiday baking. Just hearing the first few notes of the “Overture” gives me the motivation I need to wrap the last few gifts I have left to put under the tree. I took ballet as a child but retired my dance shoes around age eleven; I’m sure much to the relief of my dance teacher. I was a bit too uncoordinated and self conscious of my chubby body. And I could never get my legs stretched enough to even closely resemble a split. In spite of all this, my love for the music remains and every time I hear the horns announce the beginning of the “March” during the party scene, I recall the sparkly tutus, elegant dancers and elaborate decorations that remind me of Christmas. I played my worn Nutcracker CD the other day to get myself into the spirit of the season. Ava kicked off her shoes and pirouetted a few times across the kitchen floor, eventually crashing her long gazelle like legs into some furniture in our small house. She picked herself up and kept on going, unfazed by any obstacles and completely entranced in her love of dance. Six year old Ava as "Lead Mouse" and Fourteen year old Ava as "Ice and Wind"
I discovered these “mice” this summer at the 3 Dogs Café, Rockport, ME www.3dogscafe.com. I duplicated them in my own kitchen to surprise Ava after her performance. Children love to eat the cute critters but a steady hand is needed to add the eyes, nose and ears. Enjoy these on your holiday buffet or any time of year! Set out all ingredients needed: Unwrap kisses and place in a small bowl. Place 6 oz. semi sweet chips into a sauce pan and heat over very low heat, stirring frequently until melted, then remove from heat. Select 24 cherries with stems attached, drain and place into a small bowl. Open Oreo cookies by slicing through filling with a small knife. Place open halves onto a lined baking sheet. Cull through almonds and place 48 unbroken slivers into a small bowl. Moisten fingers with water and smooth out any dings and white marks on kisses. Begin each mouse by holding a cherry by the stem and dipping it into melted chocolate spooning chocolate over cherry to completely cover. Drip off excess and place chocolate covered cherry on an Oreo half. Place a kiss on its side and gently press the flat end into the chocolate covered cherry to attach the head. Place 2 almond slivers into the chocolate just behind the flat edge of the kiss for ears. Continue until all mice are made to this point. Place remaining ounce of semisweet chips into a microwave safe bowl. Add instant coffee and microwave at 30 second intervals until just melted. Stir until smooth. Using a toothpick, dot eyes and a nose onto each mouse. Let mice set for 3-4 hours until firm. Store for 2-3 days in an airtight container.